It was around sunset on a Monday evening in Kyoto. 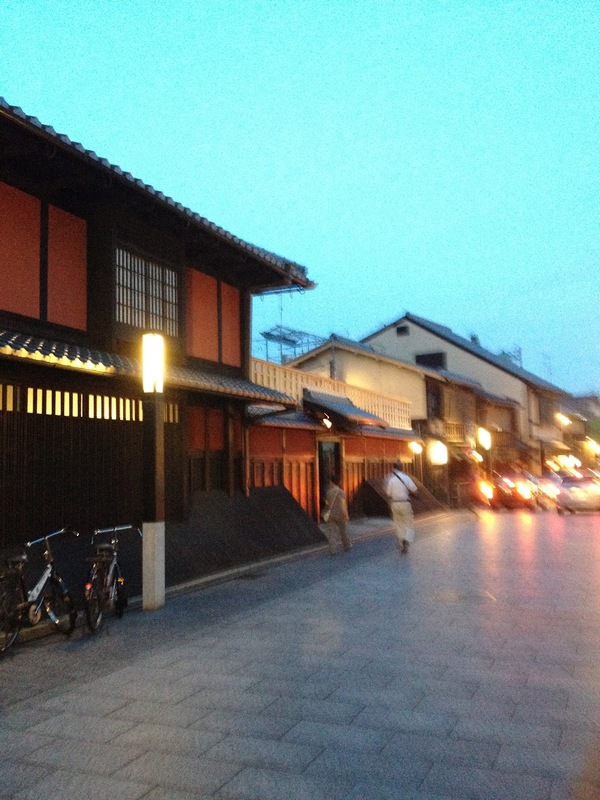 We went for a stroll through the quiet streets in the Gion district. From what I hear, Gion is the most famous district for spotting geisha in Kyoto. We hung around for some time, strolling back and forth through the quiet streets with discreet teahouses on every corner. After observing traffic for a while, I became aware that I was not the only American around. In fact, I came to find that it’s the traditional looking wooden townhouses called machiya that bring in a lot of tourists. These homes are extensive behind a small, misleading façade. Built narrow in the front, they extend back about 65 feet. This kind of architecture dates so far back, it existed even before the year 1000. We spotted our first geisha. Two of them strolled down the eerily quiet street. Their hair was in the traditional shimada style, brushed back with a bun on top, their makeup was chalky white with red pursed lips, and they wore colorful kimonos. I wondered where they were off to. Later, we spotted a taxi with men in suits exiting, followed by a geisha. We did some research, and found out that geisha literally translates to artist. These women entertain groups of men usually with a form of controlled dance, musical instruments such as the shamisen that is similar to a banjo, and some even perform poetry. The common misconception is that geisha are prostitutes. Although light conversation and flirting is common between geisha and their clients, nothing more is expected. Another cool sighting to cross off my bucket list! See a real geisha live in person, CHECK!